Low Glycemic Breakfast - starting your day right by balancing your blood sugar. Why do you need a low glycemic breakfast if you want to lose weight? Simple... breakfast is the most important meal of the day because you are literally breaking your fast. This is when you can start the day with a clean slate because your fasting blood sugar is the lowest of the day. If your breakfast is low glycemic you will have your metabolism balanced for the morning and your energy sustained until lunch time instead of getting sugar cravings by mid morning. There are significant advantages for you if this meal is highly nutritious. It will determine how the rest of your day goes. All diet plans should incorporate low glycemic eating starting with the first meal of the day. Cold cereal is not a great choice. Most commercial, boxed cereals you find on the super market shelf are loaded with high glycemic sweeteners that will spike your blood sugar and bring you crashing down and starving by mid morning! The ones in the glycemic index chart below are your very best choices. Meusli with yogurt and fruit is an excellent option. The other best choices are the cooked grains like oatmeal, buckwheat, quinoa, millet or barley. These grains have B vitamins, minerals and lots of fiber. They are far more nutritious than cold cereals and so much more filling. Bob's Red Mill is a good brand for cooked cereals that makes many combinations of grains that don't take long to cook. Just add a teaspoon of a low glycemic sweetener like agave syrup or coconut sugar if you like it sweet and unsweetened almond or soy milk or plain yogurt. A few (7 is a serving) chopped, raw nuts give you more protein and will also help to keep your blood sugar low. A new low glycemic grain is quinoa which comes as a breakfast cereal too. Quinoa flakes are available at Trader Joe's or any natural foods store and they are high in protein. Quinoa flakes also cook up really fast. Add blueberries for an antioxidant boost or any fresh fruit that's in season. If you top your cereal with a heaping tablespoon of flaxseed meal then you are getting an omega-3 food in your breakfast cereal too! Flaxseeds contain essential fatty acids called omega 3s. Omega 3 foods help you to burn fat and are highly nutritious. Make sure that any cereal you eat is a whole grain or multigrain cereal with no added sugar or high glycemic additives. It's easy to get a blood sugar spike from most cereals you see at your super market. Very few of them have not added lots of sugar or high fructose corn syrup. I have a great oatmeal recipe with apples, walnuts and dried cranberries. You can also try our low glycemic breakfast burrito for a breakfast with lots of protein. The best breakfast for your fat loss is either protein like eggs or even beans or one of the whole grain cereals above. Beans may sound strange but adzuki beans and some sprouted grain toast can make a perfectly satisfying breakfast. Low glycemic foods are slow to metabolize and will keep you energized until lunchtime. 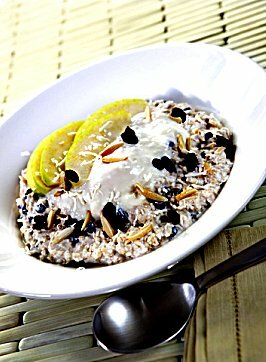 When you start your day with a low glycemic breakfast you are more likely to eat that way all day. Return from Low Glycemic Breakfast to Foods That Lower Blood Sugar..
Return from Low Glycemic Breakfast to Lifetime Fat Loss home page.